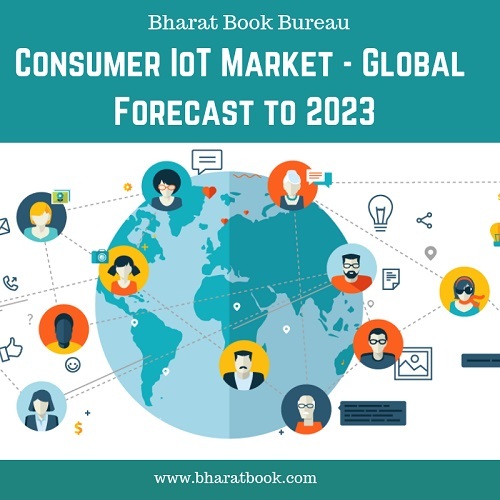 Bharat Book Bureau Provides the Trending Market Research Report on “Consumer IoT Market by Offerings (Node Components, Network Infrastructure, Solutions, snd Services), End-Use Application (Wearable Devices, Consumer Electronics, Healthcare, Home Automation, Automotive), and Geography - Global Forecast to 2023”under Hardware & Software Category. The report offers a collection of superior market research, market analysis, competitive intelligence and Market reports. The Consumer IoT Market is estimated to be USD 46.8 billion by 2018 and is projected to reach USD 104.4 billion by 2023, at a CAGR of 17.39%. The growth of the consumer IoT market can be attributed to the growing number of internet users and adoption of smart devices, increasing awareness about fitness and rise in disposable incomes in developing economies, consumer preference for increased convenience and better lifestyle, increasing significance of home monitoring from remote locations, and government regulations for security of IoT devices. The breach in data security and data privacy is the major restraint for the market. The consumer IoT solution segment consists of software and platform. The high number of interconnected devices controlling physical infrastructure and increased connectivity, which makes these devices and their networks more vulnerable to cyberattacks, is leading to the surge in demand for highly sophisticated security solutions in the IoT market. Moreover, with the increase in the number of connected devices, the volume of data is also proliferating. These huge volumes of data are driving the market for data management software. By implementing the IoT data management software, businesses are aiming to win a competitive edge with predictive analytics, as well as optimize their business operations. Home automation is expected to hold the largest share of the consumer IoT market by 2023. The increasing demand for home monitoring in remote locations, growing adoption of home automation devices in applications such as security, and HVAC and energy management, among others, have been the key factors driving the growth of the consumer IoT market for home automation. APAC is expected to have the highest growth rate during the forecast period. The increasing reach of internet across residential spaces, high consumer base, rapid urbanization, increasing disposable income, and improving IT infrastructure are a few of the key determinants supporting the growth of the consumer IoT market in APAC. In-depth interviews were conducted with Chief Executive Officers (CEOs), directors, other innovation and technology directors, and executives from various key organizations operating in the consumer IoT market. Companies profiled in this report are Qualcomm Incorporated (US), Texas Instruments Incorporated (US), NXP Semiconductors N.V. (Netherlands), Intel Corporation (US), STMicroelectronics N.V. (Switzerland), International Business Machines Corporation (IBM) (US), General Electric (GE) (US), Symantec Corporation (US), TE Connectivity Ltd. (Switzerland), Schneider Electric SE (France), Cisco Systems, Inc. (US), Amazon.com, Inc. (US), Apple Inc. (US), Alphabet Inc. (US), LG Electronics Inc. (South Korea), Samsung Electronics Co., Ltd. (South Korea), Sony Corporation (Japan), Microsoft Corporation (US), AT&T Inc. (US), Honeywell International Inc. (US), and Hewlett Packard Enterprise Company (HPE) (US). The report describes the consumer IoT market and related developments in terms of offerings [node component, network infrastructure, solution (software and platform), and service] and end-use application across different regions. It aims at estimating the market size and future growth potential of this market across different segments—offering (node component, network infrastructure, solution, and service), end-use application, and geography. Furthermore, the report also includes an in-depth competitive analysis of the key players in the market along with their company profiles, recent developments, and key market strategies. • This report includes the market statistics pertaining to offerings [node component, network infrastructure, solution (software and platform), and service], end-use application, and geography. • Major drivers, restraints, opportunities, and challenges for the consumer IoT market growth have been detailed in this report. • Illustrative segmentation, analysis, and forecast based on offerings [node component, network infrastructure, solution (software and platform), and service], end-use application, and geography have been provided to give an overall view of the consumer IoT market. • A detailed competitive landscape has been provided including key players, and the in-depth analysis and revenues of these players.